I'm not writing about nature. I'm writing about humanity. And if I have a subject, it is justice. And the rediscovery of the manifold way in which our lives can be shaped by the recovery of a sense of reverence for life. 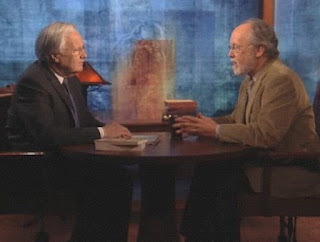 The final guest on the final episode of Bill Moyers Journal was Barry Lopez, and it's half an hour of riveting, inspiring conversation. The video is here. Ten years ago this summer, I attended the Bread Loaf Writers' Conference and Barry Lopez was my workshop leader. Those were some of the most powerful and invigorating days of my life, because Lopez was exactly the person I needed to work with at that particular moment, a moment when I doubted the purpose of writing and felt that I had wasted the countless time I had spent in the activity of writing stories and plays and essays, almost none of which at that point had been read by anyone other than my friends and teachers. I went to Bread Loaf because it felt like a last chance, and I went in cynical. I left with the tools with which to build a stronger, less avaricious, more personal sense of purpose. I still have a fraught, conflicted relationship to the idea of writing for an audience, and writing remains the most vexing activity in my life, but Barry Lopez gave me ways to work through the vexation, a way to use the despair that resides in the chasm between words and things, between writer and reader. I was in Japan. I was with a novelist, a man named Kazumasa Hirai. And everywhere I've gone in the world, I've said-- he was a storyteller, you know? We call him a novelist. But he was just a storyteller. He's like me. And I would ask him or anybody I was with, "What do you mean when you say you're a storyteller? What do you do?" Because I want to know what I'm listening for is, "Yeah, yeah, yeah, we can talk about the structure. I'm not interested in structure of sentences. What I want to know is how do you know how to behave? How do you know what to do as a person for other people? How do you know? What do you do?" Where I start from is ethical responsibility to an audience. The creation of something that is as beautiful as you can make it. And that in some way ensures that what we dream, what we really desire, not for ourselves, because that's what you do when you're a kid, but for children -- how will you ensure some possibility here by making sure we don't forget where we're going or what we're up to. The spiritual interior of the language. The best protection against forgetting. The responsibility of the writer, the storyteller. It's not about publishing, it's not about maintaining a career or feeding the monster of ego. There are times when those things matter, but they're not what the activity of writing is about. Anyone who chases primarily those things is a widget maker in a factory of useless widgets. Writing that goes beyond widget-making is writing where the writer to the best of her ability pays attention to that which is ineffable, that which exists in the unbridgeable gaps -- the spiritual interior of the language itself. But that's only half of it. The other half is the remembering, the power storytelling has to combat our short memories and to weave together a perception of humanity in the writing and the reading. A piece of writing that contributes powerfully to one person's reverence for the spiritual interior of the language and to remembering what matters is a more valuable piece of writing than one that is encountered by a million people but does not do that. These are not abstract, academic, or woo-woo New Age questions -- connect them to, for instance, Ngugi wa Thiong'o's ideas about dismemberment and re-membering and you will see how what Lopez is saying is not only interesting philosophically, but necessary to anyone who hopes to explore the beauty and terror of life. In a half-hour conversation, even with someone as marvelous as Bill Moyers, Lopez doesn't have the opportunity to expand his ideas with examples and implications, but for that you can turn to his stories and essays, particularly "The Rediscovery of North America", About This Life and Resistance, though short stories such as "The Mappist" are perfect spots to start from, too. Some of my colleagues in Lopez's workshop were annoyed by his focus on philosophy and his flouting of the regular workshop format. These were folks who in their own ways had made their peace with the act of writing and sought little more than technical advice. They wanted to know how to shape their sentences and paragraphs and pages into something a New Yorker editor might be interested in, something that might get them a good contract with a publisher like Knopf. They wanted technique and critique. They didn't want to hear about ancestors and mystics, about spiritual interiors and fiction against forgetting, they didn't want to talk about Rwanda or Antarctica, and they certainly didn't want somebody like Lopez exhorting them to think about responsibilities. "Their loss," I thought then, and think now. What I want to know is how do you know how to behave? How do you know what to do as a person for other people?